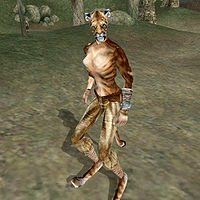 Unjara is a Khajiit slave working in the fields of the Ules Plantation. If you ask her for a kindly Redguard while trying to find a safe haven for the "escaped slave" Tul, she will admit she has heard rumors of one living nearby, but she does not know any details as it is "farther than Unjara will ever go". It is not possible to free her under normal circumstances as there is no slave key at Ules Manor. It is still technically possible to free her by using a Command spell on her and bring her to a cell where there is a slave key. This page was last modified on 8 December 2013, at 07:30.